This is a C1 post: MG received discounted treatment. If you've been around these parts for a while you'd know MG was involved in a bike crash in 2015 that led to me picking his teeth up off the road (and finding them in my pocket a week later). 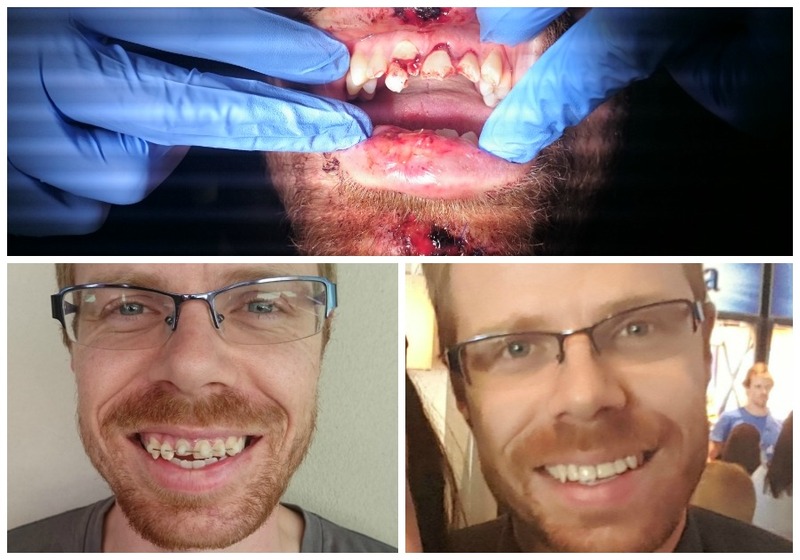 He had some major dental work done and I was blogging for the amazing Perth dentist who did it for him. I had published two of the three posts when I had my massive breakdown. So this got pushed back. Each time I tried to re-visit it, it would remind me of why I had pushed it back and I'd have a panic attack. So here we are, one whole year after it was due to be published and I'm in a position to actually do it without rocking in the corner. Recovery takes a long time. We owe a debt of gratitude to the wonderful team at Aim Dental Group, and their logo will sit on my sidebar for as long as this blog exists. They have taken care of us so well and made sure we got the best treatment and then gave me time to recover from my own health dramas to get to this point. We all get our regular check ups there, and Tricky got his fissures sealed there a few months ago. I simply cannot recommend them enough. I started slowly in the first week. Day 1 I rode the 3.2km to the train station locked up my bike then rode home again. That wasn’t too hard, so far so good. Feeling a little stiff in those rarely used muscles the next day I rested and returned to my walking/bus/train/walk routine. Day 3 I tested myself and decided to go for it. I live 12km from work as the crow flies, but my first attempt at using the best cycleways available to me was a 17km trip with what seemed like the breakaway pack from Le Tour on a hill climb. You know you aren’t going to be the fittest cyclist out there but I seriously felt like I must have been frozen in stone the way I was swiftly left behind. Strangely it takes a lot of will power to convince yourself to ride your own race and not try to give chase. Shattered, but pleasantly surprised I arrived at work some 58 minutes after leaving home. By early November I had replaced my mountain bike tyres with less knobbly road tyres, had added new cleats to keep my toes on the pedals and some grippy new handlebars kept me heading in the right direction. Confidence was high. I knew my route, was edging my way up the Strava leaderboard along my route and no longer felt like I was hideously unfit keeping up with the cycle heroes on the road. 10km into my journey home I was traversing one of the trickier sections of the ride. A long, fast downhill quickly followed by a major road crossing with older style raised islands for pedestrians and cyclists. After managing to traverse the major road crossing I was making my way slowly from the final island to the adjoining cycle path when something went wrong. It felt like it could have been game over. My head, body, bike all cascaded to the ground in between cars waiting to turn between two busy roads, and I was knocked out. For what seems the first time in my life I thought about this briefly then answered “no” to a complete stranger. I wanted to say “please help me”, but the blood was flooding my mouth and the best I could do was wobble to my feet and take their hand. Another helpful person shuffled my buckled bike off the road and I was sat up against the fence as an ambulance was called. Ambulances come really quick when you’re near a major road in a city and this one was no exception. The Samaritan bystander had helped by calling Glow after I typed her details in my phone and held it up to him. In fact with a mouth full of blood, busted teeth and a blood filled riding glove trying to keep it all in there the smartphone was an invaluable communication device in close quarters even though I was struggling to think straight and wasn’t actually using the network. The ambulance arrived then my frazzled but comforting wife. She’d shuffled the kids to a neighbour and raced from home following the sirens and flashing lights. Seeing the damage on my face, but relief that I was conscious and okay she had another kind stranger help load the broken bike into our car to take it home before driving on to the hospital. Ambulances are a strangely intimate place to be in the back of. Much like taxis you feel like you should be saying something or this is going to be one awkward drive across town. So when asked I was trying to tell this amazing paramedic how I was feeling, but really all she wanted was a thumbs up or thumbs down and kept telling me to stop trying to speak. Her number one goal was to stop me from passing out, or at least to have some indication that I was about to. 20 minutes later I was in hospital. On an ambulance stretcher in amongst returning heart patients, elderly people struggling for breath and one guy with a nasty looking broken leg. I must have spent another 20 minutes waiting there with gauze in my mouth, blood still pouring everywhere when a triage nurse decided I was bleeding too much and he had to get me out of there. I was shipped off to the fast track procedures room where Glow and my sister then caught up with me. My sister works at a public hospital (not this one) and immediately started asking all the right questions. The doctors weren’t too sure where to start with my injuries and when discovering that I’d blacked out during the accident (I couldn’t exactly go into much detail at that stage) shuffled me down the corridor into the Emergency Department proper. Here every few minutes someone was now coming up to me asking how many fingers they were holding up (which was annoying as I had to find my glasses again which were increasingly uncomfortable), what day of the week it was and my full name and address. Thankfully the bleeding was starting to cease so I could tell them what they needed to hear, albeit with a toothless lisp. 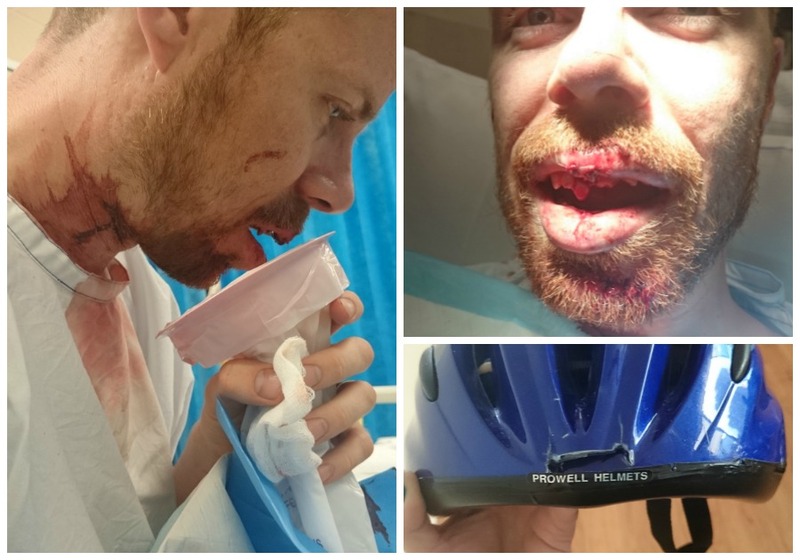 Some 4 hours after the worst bike crash of my life my face was being stitched up (my chin split and both top and bottom lips badly split apart). The amazing young doctor could even recommend seeing his dentist sister at an inner city dental surgery that worked on many trauma cases. My dental journey would start there the next day but for now, with much relief I was alive, very tired and ready to go home. On arriving home, I asked to see my helmet. I’d always been told no helmet, no riding and I’ve instilled this in my kids since they rolled out on trainer wheels. So much so that they show equal bewilderment in seeing grown adults ride by at speed with wind blowing in the breeze. Save to say, my helmet didn’t survive this crash. In fact it was split from the edge to the centre of the outer shell and closer inspection showed the inner foam had almost cracked through entirely. On this day a lifetime of helmet wearing meant my children would wake up the next day and still have (a sore and sorry) father, my wife her husband and my worried parents many miles away would still hear from their son. If you’re considering taking up cycling, no matter how or where you intend on doing it make sure you have a certified Australian Standard bike helmet. It may be the one piece of equipment you maintain on your bike that stops you becoming another road death statistic. Left: in hospital in a gown catching blood in a sick bag, dried blood covering his neck. Top right: what was left of his front teeth after having his upper lip (which was hanging off), lower lip (which was almost split in two from the inside), and chin stitched up. Bottom right: the outside view of the helmet - the inside was cracked through too, and it's not until you realize that would have been skull and brain that you go woah. The recoveryThe day following my bike crash was literally the first day of the rest of my life. I had a stitched up face and many broken, mostly missing teeth. The first thing that needed to happen was a trip into town to see a dentist and get X-Rays done and any immediate fixes they could do. I don’t think I’ve ever felt like crying quite so much as I did that day holding an icecream container to catch any blood and spit that was swelling in mymouth (I couldn’t swallow for fear of swallowing teeth fragments) and walking through from a crowded train station car park to the dental surgery. The visit mainly consisted of removing bits of broken teeth as my jaw and gums were still swollen after the impact. They did some really complicated 3D imaging x-rays which involved chomping down on a bit and staying still for over a minute (not exactly comfortable when you’re missing most of your front top teeth!) then we proceeded with the first of many necessary root canals. I went home shaken, restless and tired; still wanting to sob after running the second gauntlet across the train station bridge and seeing the estimated cost of just one tooth being $10,000 to fix. In the following days as the swelling started to recede something amazing happened. Whether from my Glow's Facebook posts or sheer coincidence with their own social media campaign, she was contacted by a local dentist with amazing specialist experience looking to work with local social media identities. It seems like hours between hearing about this and meeting for a consult with Aim Dental Group's Principal dentist Dr David Beecham, and business manager Christina Claridge on a Saturday of all days. He had his young kids in the room, we had ours and all were being entertained by screens and iPads while the bright lights lit up my empty mouth and he weighed up my options. David put my mind at ease. He took my hospital and dentist x-rays, did a couple of his own then took his time over the next week or so thinking over solutions. Two root-canal visits later and I was expecting to come in for a rather painful and invasive procedure to have a screw put in my jaw to hold one fake front tooth and a cap to be placed on what remained of the other. After spinning the 3D images a few more times (it’s awesome, you never get to see your mouth from this angle) he changed his mind and saved me thousands of dollars in the process. What happened next was amazing. I was asked to wait in the waiting room. Why? Because my new front teeth were being optimised by the computer model, then were sent to the diamond lathe out the back where they were hewn to exacting specifications to fit over precisely what remained of my teeth and gums. I’m sure I scared the bejeezus out of the kids sitting opposite me in that waiting room. I gave them a toothy smile (how many times in your life do you get to shock kids with a busted up mouth?) and sat reading a holiday magazine for the next half an hour. I sent Glow an SMS saying that my new teeth were being printed and I’d be finished soon, which elicited a very confused response. Then, half an hour later I hopped back onto the dentist’s chair (complete with the US version of The Office playing on his ceiling mount TV screen as it always is) and was shown two brand new front teeth complete with matching colour to my existing teeth ready to be polished before insertion. By this stage I’d had so many anaesthetic needles in my mouth I’d gotten past all fear of that pain and was just anxious to have my smile, my bite and lisp-free speech back. Incredibly I walked out of Aim Dental on that day with a full set of teeth and a very grateful family. The transformation! Smash face to brace face to smiley face. You'd never know he'd smashed those four front teeth! David and his team did an amazing job helping my recovery. He made every effort to charge the costs to my health provider where possible and in turn every member of my immediate family has been back in the intervening months for general check-ups, scale and cleans. Today I have my appetite for steak back, I’m not afraid to bite into an apple without cutting it up first and I’m even considering returning to cycling as my transport to work. No matter where you live or what type of bike you ride I implore you to ride with a helmet strapped on firmly. My story involved repairable broken teeth, if you ever have a crash story to tell I’d like to think a helmet will have saved your brain and you’ll have the rest of your life to share it.